The harrowing story of a man's childhood as a virtual slave, and how he eventually built a successful life in the United States. African slaves in Haiti emancipated themselves from French rule in 1804 and created the first independent black republic in the Western Hemisphere. But they reinstituted slavery for the most vulnerable members of Haitian society—the children of the poor—by using them as unpaid servants to the wealthy. These children were—and still are—restavecs, a French term whose literal meaning of "staying with" disguises the unremitting labor, abuse, and denial of education that characterizes the children's lives. In this memoir, Jean-Robert Cadet recounts the harrowing story of his youth as a restavec, as well as his inspiring climb to middle-class American life. He vividly describes what it was like to be an unwanted illegitimate child "staying with" a well-to-do family whose physical and emotional abuse was sanctioned by Haitian society. He also details his subsequent life in the United States, where, despite American racism, he put himself through college and found success in the Army, in business, and finally in teaching. Today, Jean-Robert Cadet holds a Master's Degree in French literature and works to help aid other restavec children. I knew three groups of children in Port-au-Prince: the elite, the very poor, and the restavecs, or slave children. Children of the elite are often recognized by their light skin and the fine quality of their clothes. They are encouraged by their parents to speak proper French instead of Creole, the language of the masses. They live in comfortable homes with detached servants' quarters and tropical gardens. Their weekly spending allowance far exceeds the monthly salary of their maids. They are addressed by the maids with "Monsieur" or "Mademoiselle" before their first names. They are chauffeured to the best private schools and people call them "'ti' [petit] bourgeois." Children of the poor often have very dark skin. They appear dusty and malnourished. In their one-room homes covered with rusted sheet metal, there is no running water or electricity. Their meals of red beans, cornmeal, and yams are cooked under clouds of smoke spewed by stoves made of three coconut-size stones and fueled by dried twigs and wood. They eat from calabash bowls with their fingers and drink from tin cans with sharp edges, sitting on logs while being bothered by flies. They squat in the underbrush and wipe with rocks or leaves. At night, they sleep on straw mats or cardboard over dirt floors while bloodsucking bedbugs feast on their sweaty flesh. They walk several miles to ill-equipped public schools, where they depend on lunches of powdered milk, donated by foreign countries that once depended on the slave labor of their ancestors. After school, they rush home to recite their lessons loudly in cadence before the Caribbean daylight fades away, or they walk a few miles to Park Champ-de-Mars and sit under streetlamps to do their homework while moths zigzag above their heads. Restavecs are slave children who belong to well-to-do families. They receive no pay and are kept out of school. 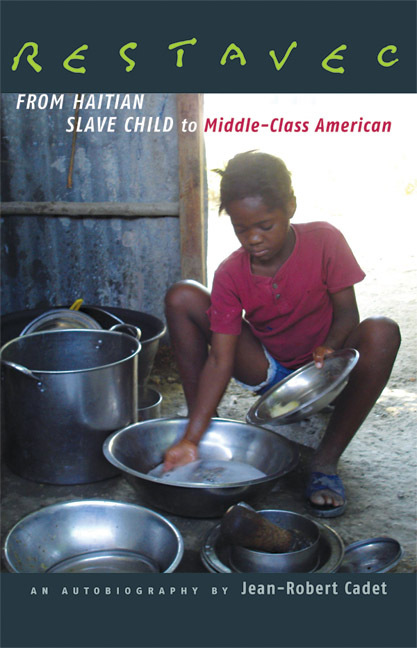 Since the emancipation and independence of 1804, affluent blacks and mulattoes have reintroduced slavery by using children of the very poor as house servants. They promise poor families in faraway villages who have too many mouths to feed a better life for their children. Once acquired, these children lose all contact with their families and, like the slaves of the past, are sometimes given new names for the sake of convenience. The affluent disguise their evil deeds with the label restavec, a French term that means "staying with." Other children taunt them with the term because they are often seen in the streets running errands barefoot and dressed in dirty rags. Restavecs are treated worse than slaves, because they don't cost anything and their supply seems inexhaustible. They do the jobs that the hired domestics, or bonnes, will not do and are made to sleep on cardboard, either under the kitchen table or outside on the front porch. For any minor infraction they are severely whipped with the cowhide that is still being made exclusively for that very purpose. And, like the African slaves of the past, they often cook their own meals, which are comprised of inferior cornmeal and a few heads of dried herring. Girls are usually worse off, because they are sometimes used as concubines for the teenage sons of their "owners." And if they become pregnant, they are thrown into the streets like garbage. At maturity, restavecs are released into the streets to earn their living as shoeshine boys, gardeners, or prostitutes. I was a restavec in the making.